The current smoking rate for adults over age 18 in the US has dropped to 15.1%. However, disparities still exist, with higher smoking rates among populations with lower levels of education, those living below the poverty line, LGBTQ individuals, men, those living in the South and Midwest, as well as among American Indians/Alaska Natives, those living with a disability or severe psychological distress, and those who are insured by Medicaid or are uninsured. Smoking attributable deaths were high across the country, accounting for 28.6% of all cancer deaths. However, the proportion of deaths attributable to smoking varied across states and was highest in South. 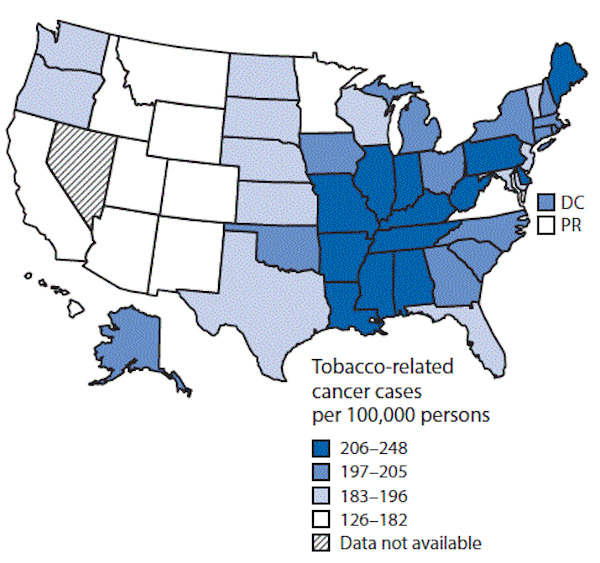 In Kentucky, Arkansas, Tennessee, West Virginia, and Louisiana, smoking accounted for 40% of cancer deaths among men. The authors argue that the disparity in state smoking-attributable deaths is due to a disparity in strength of tobacco control policies and funding for state tobacco control programs. They suggest that one solution for states that are stalled on increasing cigarette excise taxes and passing smoke-free air laws is to increase local-level policy innovation. Other strategies include monitoring tobacco industry interference, researching how to frame tobacco control messaging for evidence based policies, and translating, disseminating and implementing sustainable policies. In addition to between states disparities, disparities between racial/ethnic groups and income groups also need to be addressed. This piece highlights the prevalence of flavored tobacco use across the US and the association of flavored tobacco use with polytobacco use, fewer quit attempts, and youth appeal. 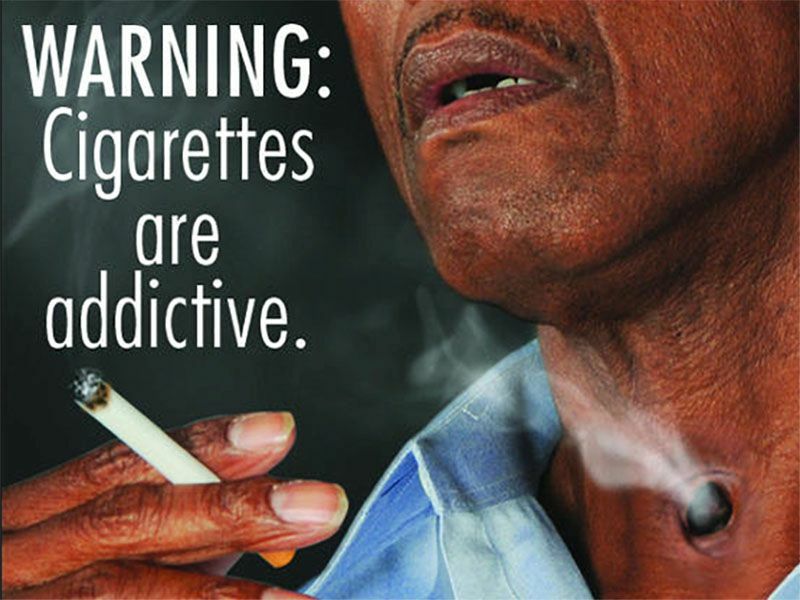 It also highlights the potential health effects of flavored tobacco products. Never smokers and younger adults were more likely to use fruit flavored e-cigarettes and cigars, while menthol flavors were used more by older adults, current smokers, and former smokers. Flavored cigar use was higher among young adults and among African Americans, which may reflect that neighborhoods with a higher proportion of young people and African American residents have more marketing and promotions for these products. An analysis of internal tobacco industry documents as well as brand websites, national newspaper articles, and trade press revealed that tobacco companies associate flavored smokeless tobacco with young and new tobacco users. Internal tobacco industry studies showed that candy-like, sweeter, and milder flavors such as fruit and mint could increase the appeal of tobacco to new users by masking the harsh taste and mouthfeel of tobacco. They found that the anesthetic and sensory qualities of mint and menthol flavors may also encourage current users to continue use, and the sugar in flavored products could also reduce the pH of the tobacco and make the nicotine delivery faster. An analysis of data from the 2014 National Youth Tobacco Survey shows that youth who have never smoked cigarettes but report using flavored e-cigarettes within the past 30 days were 5 times as likely to report intentions to start smoking compared to those who did not use e-cigarettes. Youth who used flavored e-cigarettes were nearly twice as likely as youth who used non-flavored e-cigarettes to have intentions to initiate cigarette use. Youth who currently both smoke cigarettes and use flavored e-cigarettes were 60% less likely to intend to quit within the next year than youth who did not use flavored e-cigarettes. Using non-flavored e-cigarettes, however, was not associated with decreased odds of quit intentions. Both never smokers and current smokers who used e-cigarettes perceived tobacco as less dangerous than those who had not used flavored e-cigarettes. A study of youth tobacco use and e-cigarette availability and marketing around 41 schools in New Jersey found that rates of both ever and past-month e-cigarette use were higher among students in schools located in an area with greater e-cigarette retailer density. Similarly, rates of past-month e-cigarette use were higher among students in schools that had higher amounts of e-cigarette advertising within a half mile. This provides evidence that the point of sale environment around schools may influence e-cigarette use among youth. 58.8% were current cigarette smokers. 11.4% had never been cigarette smokers. In addition, 40% of younger users (18-24 year olds) were never cigarette smokers, compared to 1.3% older users (≥45 year olds). An increasing number of Americans believe e-cigarettes are as harmful as combustible cigarettes, which the authors suggest highlights the need to for public health messaging that accurately portrays both the potential for reduced harm and absolute harm of e-cigarette use. Based on the SimSmoke model, the addition of pictorial health warnings to cigarette packs in the US would reduce smoking prevalence by an additional 5% in the short term and 10% over the long term. Over the next 50 years, pictorial health warnings would prevent 652,800 smoking attributable deaths, 46,6000 low-birth weight cases, 73,600 preterm births, and 1000 cases of sudden infant death syndrome.